News TWO WEEKS TO THE DMF PROGRAMME DEADLINE – AND COUNTING…! TWO WEEKS TO THE DMF PROGRAMME DEADLINE – AND COUNTING…! First of all, we’d like to say a very big thank you to all our loyal and generous sponsors who have helped make Dart Music Festival so successful year upon year. Although it’s been said many times before, it is still true – we really could not do it without your support. Just a reminder that our programme inclusion deadline is 8th March so please make sure you don’t miss out this year. 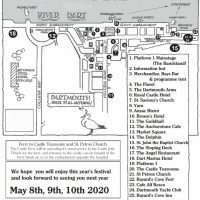 Dart Music Festival has become a firm favourite in the Dartmouth festival calendar, bringing vibrancy, fun and friendship to the town. It has proved to be a great community event, encouraging locals and visitors alike. As always, costs to put on this ‘free’ Festival have risen and this year it’s likely to be a staggering £70,000+ so with no funding any sponsorship and donations received are absolutely vital to the event’s success. If you would like to help make our 20th Anniversary your best year ever please consider joining our loyal band of Sponsors. Every penny truly does help – probably more than people realise. The benefits are many – but surely the greatest reward must be in knowing that you have been part of making it all happen for yet another year? 2015 Sample programme – new one out soon! All our sponsors are listed in the DMF programme – hundreds of which are sold online and during the Festival and it’s also available to download from the website. However if you want to be included you’ll have to be quick as the programme deadline is 8th March 2017 and time is running out. Just contact our Sponsorship Secretary Julie on dmfsponsors@gmail.com and she will be happy to help. Dartmouth businesses have consistently reported increases to be in the region of 30% plus, and quote that this weekend provides the ‘best weekend ever’. As a business sponsor, there are many benefits. As well as inclusion into the programme, you will be featured on the DMF website throughout the year with links to your own website. Accommodation businesses and Eateries are also featured on our ‘Where to Eat and Stay’ page, and retailers on ‘Where to Shop’. This will direct our many website visitors straight to you – and it doesn’t end after the Festival – we mail our visitors throughout the year. BECOME A DMF SPONSOR AND REALLY MAKE A DIFFERENCE! DON’T FORGET – THE DEADLINE FOR INCLUSION IN THE PROGRAMME IS FAST APPROACHING. PLEASE GET YOUR SPONSORSHIP IN BY 8TH MARCH BEFORE IT’S TOO LATE. EVERY LITTLE HELPS, SO THANK YOU – YOUR SUPPORT IS VERY MUCH APPRECIATED.